“Baby-wearing” is recommended not just as a response to crying, but to prevent crying and promote parent-infant attachment and the baby’s development. You could place your baby in a front pouch and “wear” her around the house while you cook, clean, or even pay bills, for example. If you’re doing active chores, be sure to keep safety in mind. This technique may make your baby cry less and enhance her learning. Note: Check with your baby’s care provider before using a baby pack or pouch—sometimes NICU graduates do not have enough muscle strength to keep their airways open in an unsupported position. Some parents worry about spoiling their infant with too much holding. Don’t worry. Experts agree that holding a baby in the early months meets the infant’s basic need to feel safe. In fact, babies who are picked up as soon as they begin to cry tend to cry less often and for shorter periods than do babies whose parents don’t respond quickly. This doesn’t mean you have to pick your baby up with every peep you hear. 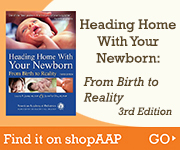 As your baby grows, let her learn about and explore personal ways to self-comfort. She will discover that sucking her fist, holding her blanket, or clasping her hands together will help her feel better for a few moments.